Humans see the world through a pair of high resolution, single lens eyes that allow us to adjust focus and pinpoint fine details. But simpler creatures, like insects, instead rely on compound eyes that have lower resolution but offer a much wider distortion-free field-of-view that's actually better suited for lightning fast motion perception. And as researchers work towards designing autonomous drones that will behave like futuristic artificial bugs, it's only fitting that they also work to replicate how an insect sees. Of course understanding and recreating Mother Nature has always been one of our biggest challenges, but a research project known as the Curvace believes it's created a prototype artificial compound eye that comes pretty damn close to the real thing. Composed of three separate layers including an array of microlenses sitting atop an array of photodetectors, the Curvace promises to provide drones with an incredibly wide field of vision that will allow the craft to navigate obstacles even in the dark of night. 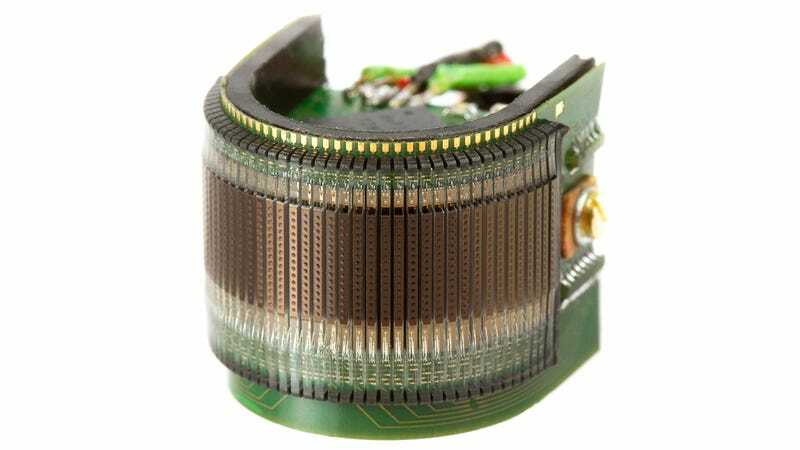 The compound eye won't be used for capturing surveillance footage or images, that will still require a camera with higher resolutions so the images can be analyzed. But will instead serve as a robust, low-power way for a drone to autonomously navigate its surroundings, and more importantly, be immediately alerted to incoming threats.